SAN ANTONIO, TX--(Marketwired - Mar 19, 2014) - A study of the air inside typical American buildings reveals that people breathe in as many as 2,000 different types of germs on any given day. Obviously, reducing that number is a smart way to guard against disease and help to ensure long-term health. However, until recently, restroom hand dryers have relied on HEPA filters and other old-fashioned measures, which trap but do not kill microbes. A new product from American Dryer® features Cold Plasma Clean™ (CPC) technology, which destroys germs without presenting a threat to humans. CPC dryers spray a stream of ionized oxygen molecules into the air blowing from the hand dryer. These ions are lethal to all sorts of pathogens that cause disease and infection, such as staph, tuberculosis, MRSA, E. Coli, and thousands of others. CPC dryers create a bubble of purified air around the hands being dried, sanitizing the surface of the hands as well as the surrounding air. Cold Plasma Clean™ technology also destroys mold particles in the air; eliminates harmful gases, bacteria and VOCs; neutralizes objectionable odors; and does not require maintenance or expensive filters. American hand dryers with CPC technology have passed stringent tests performed by consumer protection groups like Underwriters Laboratory (UL) and EMSL Labs. 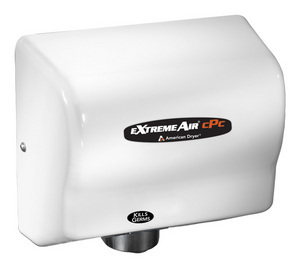 To find out more about CPC dryers, visit Allied Hand Dryers. Allied Hand Dryers offers an extensive selection of premium and affordable hand dryers, a double-the-difference lowest-price guarantee, free shipping in all 50 states, and same-day shipping in the contiguous U.S. Learn more at www.HandDryer.com.